This reading group guide for Of Bone and Thunder includes an introduction, discussion questions, and ideas for enhancing your book club. The suggested questions are intended to help your reading group find new and interesting angles and topics for your discussion. We hope that these ideas will enrich your conversation and increase your enjoyment of the book. In his newest novel, Chris Evans rewrites the Vietnam War, using a fantasy setting to explore racial, political, and gender conflicts as well as war itself. The Kingdom has responded to insurrection in Western Luitox with a full-scale assault against the rebel Forest Collective. Of Bone and Thunder chronicles the war through the experiences of several soldiers as they fight an increasingly unwinnable war. For thaum Jawn Rathim, the war not only brings him face to face with his own personal limitations but with the truth about his country. Crossbowman Carny Qillibrin must choose between looking out for himself and becoming part of a larger community. Sky Horse Leader Vorly Astol finds his world turned upside down by the arrival of new magical techniques as well as strange new collaborators. As the war continues without end in sight and unrest stirs at home, each character struggles to find his place in the strange world of combat, conflict, and shifting loyalties. 1. Chris Evans dedicated Of Bone and Thunder to Vietnam War veterans. How important is your knowledge and understanding of the Vietnam War to your reading of this novel? 2. Discuss the ways in which the author uses different races (humans, dwarves, and slyts) to parallel the racial politics of the Vietnam War. How do they match up? What do these parallels highlight and what do they obscure? 3. At the beginning of the novel Jawn Rathim thinks, It’s what men did, what they always did. They went to war because there was one. There was no better way to prove to yourself and everyone around you what you were made of. (p. 17). Do you think that he still believes this by the end of the book? 4. One of Jawn’s first experiences with the slyts is the mass suicide protest organized by the peasantry. What does it teach him about the conflict, and how does that knowledge shape the rest of his combat experience? 5. How is the experience of war itself changed or complemented by the addition of magic and the supernatural? 6. There are few female characters in Of Bone and Thunder; the most notable is RAT Grunila “Breeze” Niorsmith. How do the challenges she faces in her work illustrate the status of women in the Kingdom? 7. How do the political upheavals in the Kingdom affect the soldiers’ realities in Luitox? In what ways do the Kingdom’s politics mirror American politics during the Vietnam War? 8. Which perspectives and characters did you find the most compelling? Which the least? 9. Morality is fluid for the characters: killing noncombatants, disputes with other races on their own side, and recreational use of drugs are all addressed and, in some cases, dismissed by the soldiers as inevitable. Discuss the ways in which combat changes the characters’ perspectives on ethical and moral behavior. 10. Consider the parallel journeys of thaum Jawn Rathim and Crossbowman Carny Qillibrin. Both rise to take on new responsibilities, but only after dramatic failures. How much of their failures and successes are due to their personalities, as opposed to their different positions? 11. What note does the book end on? What do you see coming next for the characters? Is the ending satisfying? 12. How does Of Bone and Thunder compare to other fantasy and/or military novels you’ve read? 13. Have you read other novels by Chris Evans? If so, how does this one compare? 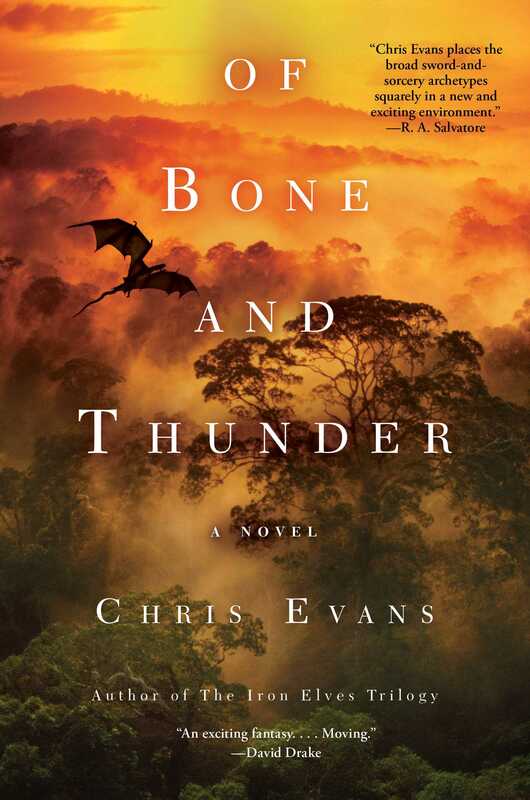 If not, does Of Bone and Thunder make you want to read more by this author? 14. Does Evans appear to have an agenda in writing this book? What do you believe he hopes to accomplish with Of Bone and Thunder? 1. Interested in similar reading? For further reading about war: Matterhorn, Karl Marlantes; Redeployment, Phil Klay; Billy Lynn’s Long Halftime Walk, Ben Fountain; Catch-22, Joseph Heller. Other military fantasies: His Majesty’s Dragon, Naomi Novik; the Codex Alera series, Jim Butcher; the Shadow Ops series, Myke Cole. 2. Fantasy worlds have evolved significantly in moral complexity from The Lord of the Rings and Narnia to present-day series like A Song of Ice and Fire. In many cases, good and evil are no longer clearly defined. Place Of Bone and Thunder and your own favorite books or series along the spectrum, from “well-defined” to “chaotic,” and discuss your reading preferences. 3. Divide the book club members into groups based on Of Bone and Thunder: thaums, dwarves, enemy slyts, cooperative slyts, dragon riders, foot soldiers, press. Draw your group assignment at random from a bowl or hat. Reconsider the book from the viewpoint of your new affiliation; how does it change your perspective, if at all? "A masterful debut -- if J.R.R. Tolkien and Bernard Cornwell had a literary love child, this would be it." "A fantasy in which the gritty realities of war and politics are as important as the magic -- and all are handled very well." "I'm always thrilled by seeing a new author press the boundaries of the conventions of fantasy. Chris Evans does just that -- taking the broad sword and sorcery archetypes and placing them squarely in a new and exciting environment." "Evans's first novel heralds the launch of an outstanding military fantasy series unlike any since Glen Cook's beloved "Black Company" series... Strong storytelling, a compelling cast of heroes and villains, and a keen knowledge of military tactics of the Napoleonic era make this a priority purchase for most libraries and a splendid read for fans of both sf and fantasy military adventure. Highly recommended." "Evans evokes the era of Napoleon with muskets and slashing swords while neatly mixing in military fantasy, swords and sorcery, and a great deal of success; readers will no doubt end up desperate for the next volume."